You can now choose the LPub3D “Native” Renderer at the renderer combo control in Preferences. The Native renderer uses the integrated LeoCAD module which does not use the “L3P” pattern to define camera globe settings. Consequently, I have improvised a “Factor” that can be adjusted manually to properly scale rendered images. At present, a factor of 270 is suitable for rendering images with a scale of 1 on A4 portrait. This is the default Factor currently set in LPub3D for the Native renderer. As an example, 450 is the factor for .5 scale on A4 landscape. Simply adjust the scale on the Project Setup dialogue and render a sample page until your images are suitable to your liking. The Project Setup dialogue now offers the ability to select your renderer. 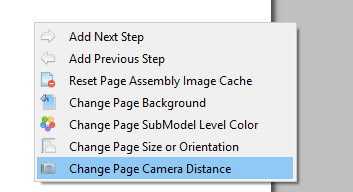 You also have the choice to apply page-specific LOCAL camera distance factors in the event your document is mixed orientation and/or mixed page size using the page context menu. Lastly, you can choose to set your factor as an application setting (i.e. in the registry, plist, ini etc..) by checking the “Set as default” box. This approach allows you to forfeit adding meta commands to your model file. 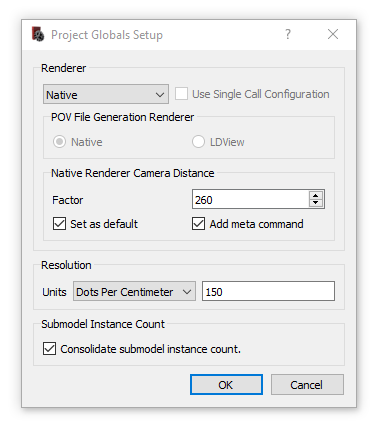 Uncheck the “Add meta command” box to avoid adding Native camera distance meta commands to your model file. This setting is global so it is not advisable to use it on mixed page/orientation instructions. I consider this scheme interim until I work out an algorithm to automatically calculate a reasonable camera distance taking into account the myriad of scale and page-width configurations possible.